Rebecca was born in Dublin in 1991 and has been singing and performing since the age of 4. She started out singing at the Christmas Eve Carol Service in the Church of Our Lady of Victories, Sallynoggin/Glenageary where her father was the Organist and Choir Master. 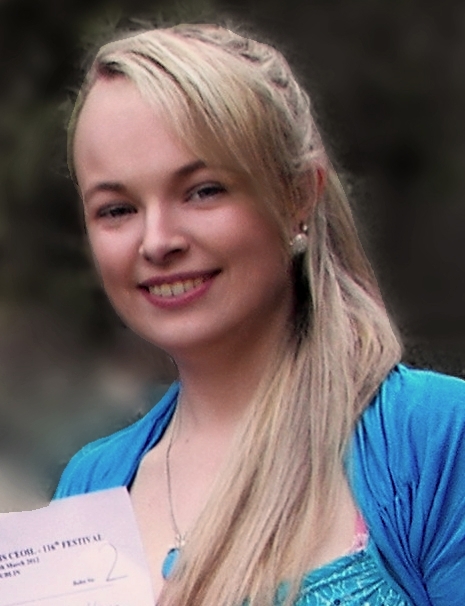 Rebecca is now an Honours Graduate in Music from NUI Maynooth majoring in Performance and Composition. Rebecca has loved music all her life and has studied Piano and Singing from a young age. She is at present preparing for her Senior Certificate in Piano and studies with her father Frank Kelly, a noted Piano Teacher. She has studied singing with a number of high profile singing teachers including Virginia Kerr and Deirdre Cooling Nolan and presently she studies with Lynda Lee at the Royal Irish Academy of Music. She has had major roles in many musicals. Her most recent was Alice in Disney’s ‘Alice in Wonderland’ and she starred as Calamity Jane in in her school production of ‘Calamity Jane’. Rebecca has been highly placed in many Feiseanna in Arklow, New Ross and in Feis Ceoil over the years and has made many TV appearances, her most recent being on ‘The Voice of Ireland’ where she came through three pre-televised rounds and got through the Blind Auditions as far as the Battles. She also featured on TG4's ‘Feis and Blood’ with her family ensemble Classic Harmony, formerly known as The Kelly Family Vocal Ensemble, where they came 2nd. The family have also been featured on RTE’s ‘Nationwide’ and on TV3’s ‘The Morning Show’. Rebecca has appeared on Local and National radio including the John Murray Show at Christmas 2010. She was also the Ashford Rose in 2012 in the Wicklow Regatta competition. As well as being a member of Greystones Theatre she has also been a member of Bray Youth Choir and Talented Kids Ireland. She presently sings with Bray Choral Society, Wicklow Choral Society and The Kelly Family Vocal Ensemble. For a list of the professional services supplied by Rebecca, click here. For a full C.V. for Rebecca, click here.